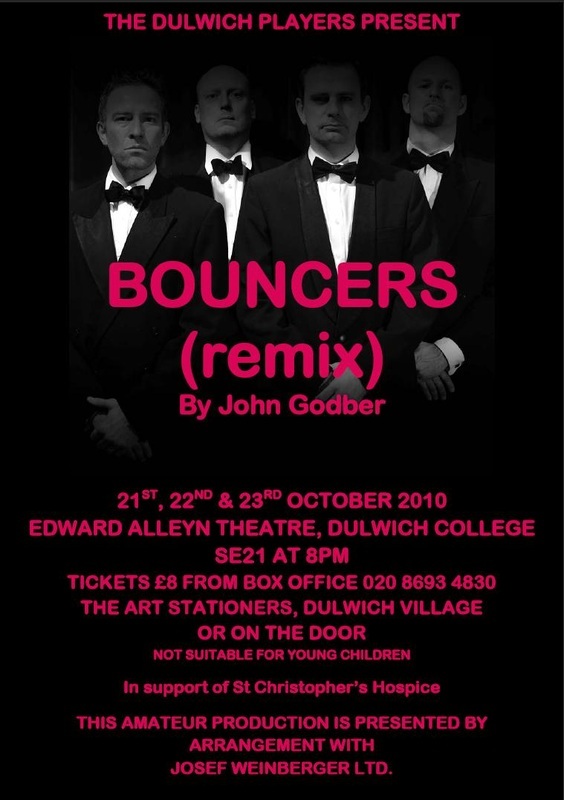 "Bouncers", by John Godber, was the Dulwich Players' autumn production. 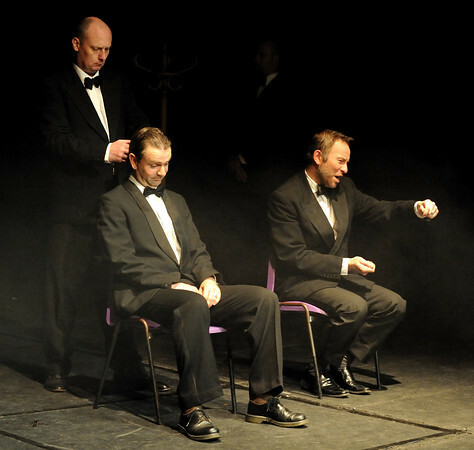 The players, over the years, have always endeavoured to present a wide repertoire of dramas; comedy, farce, verse plays, musicals, original plays and standard classics such as Ayckbourn and Shakespeare, to name but a few. The Players have always been fortunate in having enthusiastic members who are interested in many aspects of theatre; directing, lighting, sound, set design, make up and of course acting! Directors have always been encouraged to consider the members when choosing plays so as to offer opportunities to new and old members. There are occasions when a director decides that there is a play they must present and it becomes a mission, an endeavour, perhaps even a labour of love. 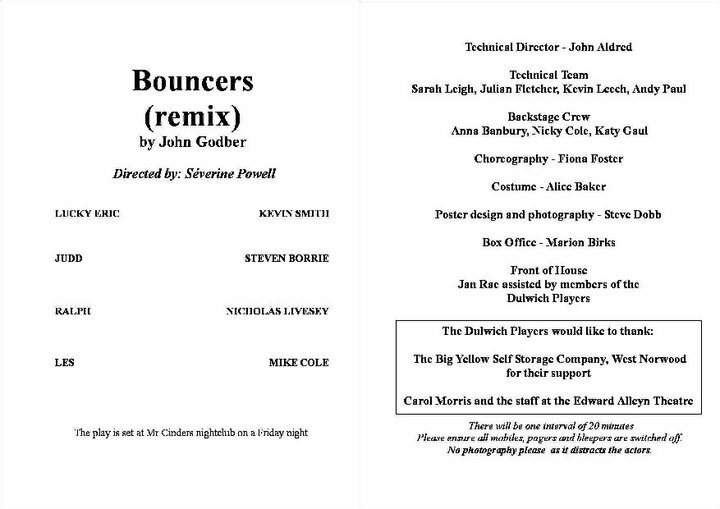 "Bouncers" with a cast of four actors was the choice of our retiring Chair, Séverine Powell. Séverine has worked tirelessly for the Players over a difficult time in their history. It was very fitting then that she was able to conclude her chairmanship with her choice of play, "Bouncers", and bring her usual enthusiasm and determination to direct this challenging production. 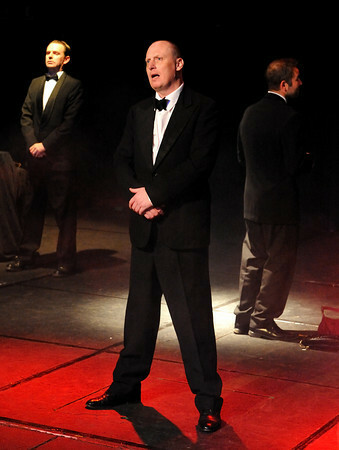 John Godber, a student of regional theatre himself, is best known as a one of the "regional playwrights". In his early days he became Artistic Director of "The Hull Truck Theatre Company", where he wrote many plays that embraced and presented life in this region. 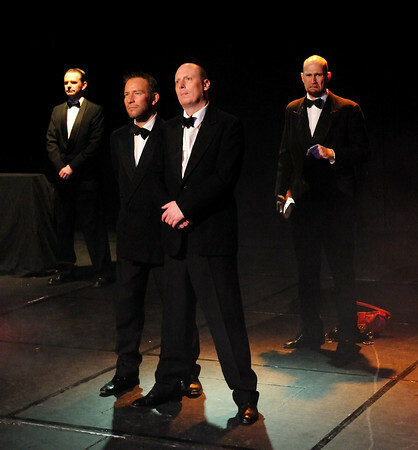 "Bouncers" is a rather sad reflection of life as lived by four "no-hopers" who are bouncers at a local night club, " Mr. Cinders". This slice of life was not to everyone's taste, the misery and complaints described were inclined to be repetitive and some scenes were rather too long. However when it came to presentation and acting the results were excellent. The four actors not only performed as bouncers, but also punks, "ladies of the night" shy but eager young girls, bully boys, lechers, and young men freezing in the cold outside the night club. Kevin Smith, Steve Borrie, Nick Livesey and Mike Cole were a splendid team. Sharing the same job but showing four distinct personalities, their movement and body language could not be faulted. They had obviously worked very hard to create such a diversity of characters and yet still retain their own character's identity. The staging was most convincing; the mist, smoke that hung in the air and the red lighting gave an atmosphere of darkness, grime and glimpses of the seamier side of life! John Aldred and his team achieved a most subtle ambience. The humour of this play is created by the hopelessness of the characters, the outcomes arising from their inability to cope with life's problems and the dogged hope that tomorrow would be better. All aided by some fairly "lavatorial" humour from time to time. Although this drama may not have been to everyone's taste the actors, director and production team are to be congratulated for their excellent performances and production: a very convincing and entertaining interpretation of the author's work.